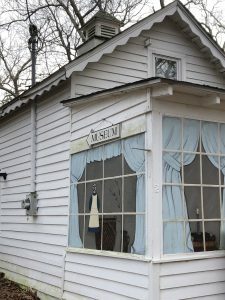 The history of the cottage/museum is vague. In 1875 during the first sale of lots at the Camp Meeting, Dr. Benjamin Abbott leased two lots, one being #2 Wesley Avenue. This lease subsequently transferred to Anthony Steelman. Either leasee may have had the building constructed. Due to the lot size, 18X30 ft., and that of the cottage, 10X12 ft., in all probability the first shelter on the site was a tent. An elevated wooden platform, the size of the tent to be rented or purchased, was erected plus a wooden frame over which the tent fitted. Tradition strongly suggests the permanent structure was built in 1878 using the same platform/frame structure and dimensions. Other lease owners from August 1908, Miss Abbie Spence, and from June 1936, Gussie (Augusta) Thompson, both of Heislerville, N.J. In June 1975 Rev. Robert Howe was assigned the lease to #2 Wesley Avenue from the estate of Miss Thompson. Initially the two story cottage, second floor accessed by a ladder, had no porch, only a portable platform, which Gussie Thompson would set out at the front porch during camp meeting. It accommodated two rocking chairs, one for herself, the other for “Mom”. Netting over the front door weighted by stones in the hem kept out the flies and mosquitoes, the present screened porch being a later addition. The Museum now occupies Lot #4 Wesley Avenue. It contains exhibits and Camp Meeting memorabilia. The first floor has been sparsely finished as it may have been early in the century. The Memorial Museum was given to the Association by James and Janis Howe as a memorial to Jim’s father, the Rev. Robert B. Howe. Rev. Howe retired in 1976 after 41 years of service. For thirteen years, 1973-85, he was the camp president, followed by three additional years on the Board of Directors.